G.S Aviation are the UK dealers for Ivo Prop products, these props are used by hundreds of Microlights in the UK, and are both durable and produce a smooth even thrust/ power curve. Ivo Prop employ a unique Quick pitch adjustment system which adjusts all the blades together be it two or three blades. This Quick adjust system allows the propeller to be adjusted in just minutes by loosening one large lock nut. Ivo Prop are manufactured from a combination of carbon fibre and micro bubble construction, which is both very tough and flexible, so that the blades will withstand stone chips and abrasion in the pusher configuration better than a lot of its competitors. The blades are not only strong but the stainless steel leading edge tape fitted also backs up the construction in case of small leading edge strikes i.e. small stone chips from tarmac runways. Ivo Prop offer a range of products from the Ultra light blades through the MeDium blade to the Magnum for Lycoming /Continental powered light aircraft. An electric in-flight adjust system is also available for the more advanced aircraft with a faster cruise. Ultra light blades suitable for all 2 stroke engines, diameters from 72" to 52". MeDium blades suitable for 912 series 4 stroke engines, diameters from 72" to 52"
Magnum blades suitable for Lycoming/Continental powered aircraft, 2 to 6 blade configuration. 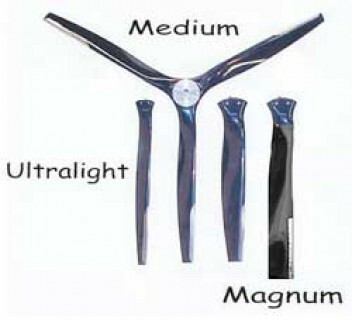 £8.40 inc VAT per blade.